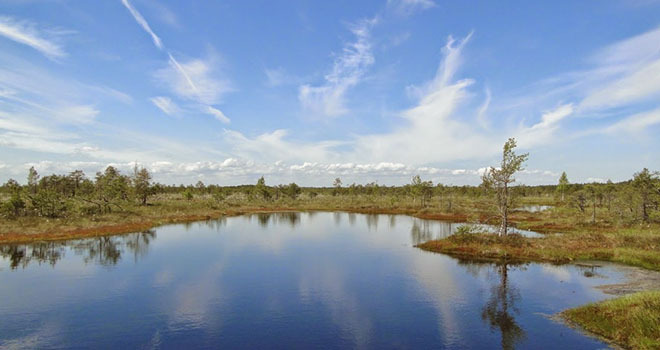 Our first stop is the Kemeri National Park which was established in 1997 and is the third largest National Park in Latvia. 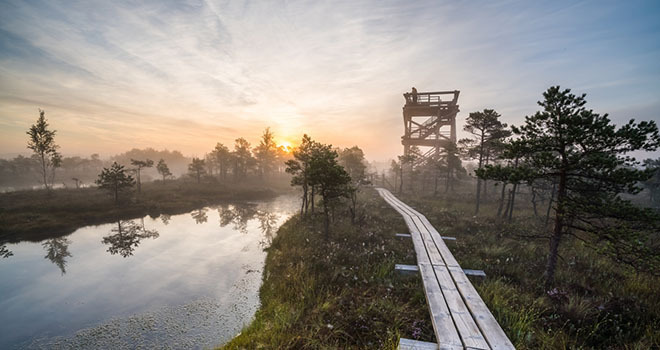 This is where you have a chance to visit the Great Kemeri Bog Boardwalk. 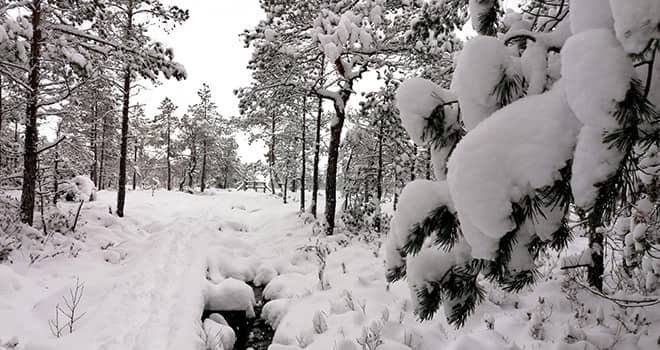 You can choose between 1.4 km and 3.4 km long nature trails. The small circle will lead you to the first picturesque lakes, while the big one offers enjoying the landscape from above when climbing a sightseeing tower. 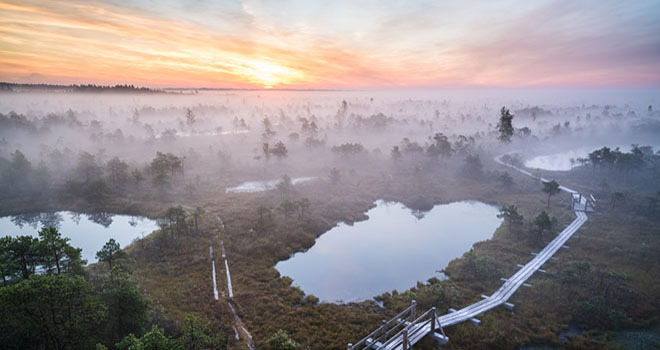 Both footbridges are made of wooden planks thus providing you with an easy and safe acquaintance with this amazing world of mosses, bog pine-trees, pools, dark little lakes, and the smell of Marsh Tea. Next stop - Kemeri town which officially was founded in 1838, when the emperor Nicholas I of Russia gave this land for building the first bath-house with mineral water. Kemeri town is somehow so unique – it looks like time has stopped here. Houses, many of which date back to 19th and early 20th century, Russian Orthodox Church (built in 1893) and walk through a lovely park will make you feel like you are traveling in time. 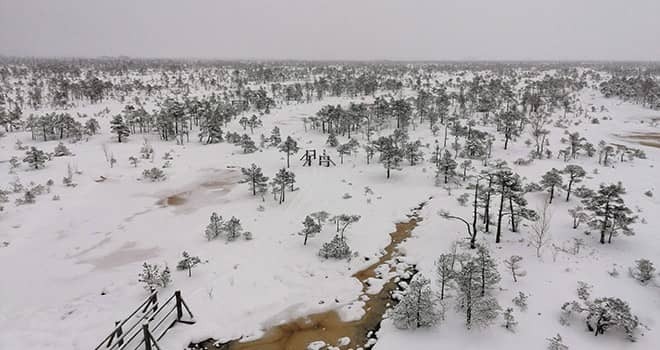 There is no place in Western Europe where Sulphur water can be found in such amounts as in Ķemeri and one of the sulphur springs is located right in a middle of Kemeri town. It is considered to be healthy to wash face with the water from this spring. After Kemeri town we drive north to have a stop near the Baltic Sea where you will have an option for a lunch followed by a lovely walk near the picturesque coastline afterwards and possibility to swim in the sea. Road back to Riga will lead via Jurmala – the most famous beach resort town of Baltic States. 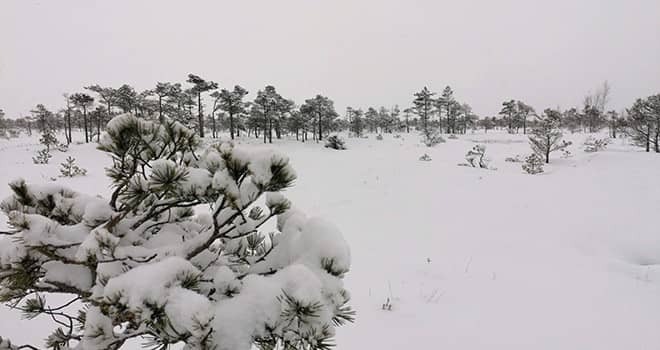 Within 20 km of drive you will see almost all suburbs of the town starting from Soviet time block buildings in Kauguri until beautiful 19th/20th century wooden houses in Dzintari and Majori. This tour is covered by a standard car or a 9seat van to keep the groups small. Please dress according to the weather and wear proper shoes for walking. Possibility to hire Nordic walking poles and binoculars (please inform us in advance).